They look fearsome and quite intimidating. Surely this creature is aggressive and dangerous. 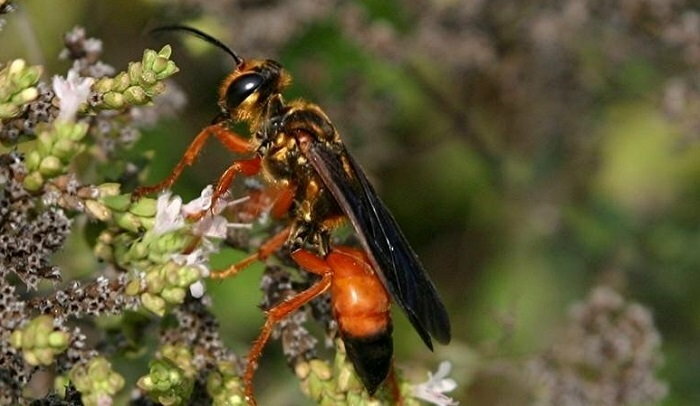 The Great Golden Digger Wasp sends its share of terrified gardeners running for a weapon. 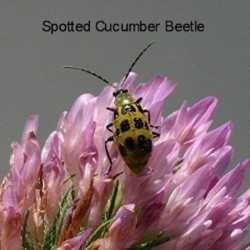 Little do they know that it is a peaceful insect and a beneficial predator of garden pests. They have an amazing life, and should be welcomed to your flowers. Great Golden Digger Wasps are found throughout North America, Mexico, Central and South America, and even the Caribbean. They are quite identifiable by their bright orange bodies, black tipped abdomen, and the golden hairs covering the thorax. As long as sandy clay soil, a nectar source, and a population of long-horned grasshopper species are available, they can be found in rural areas and urban lots. Sphex ichneumonus is a very large and intimidating member of the wasp family. They live solitary lives, and do not defend territory or nests like their paper wasp cousins do. The adults feed on nectar from flowers, and rarely notice any other creatures, except to beat a hasty retreat when something larger approaches. Sometimes a group of these wasps can be observed flying close to the ground. They may have found a suitable area to dig nests, or a concentration of prey insects may live there. They are not part of an organized colony, simply individuals that prefer the same habitat. These wasps have a unique life cycle, and it is quite amazing to watch one work. The female digs a chambered tunnel in open ground, and proceeds to stock it with food for her young to eat. She searches for insects from the family of long-horned grasshoppers. These include various crickets, katydids and grasshoppers. She captures one in her grasp, and with her sting, paralyzes it. It is then flown or dragged to the entrance of her burrow. Here, she goes through a ritual that is unique among insects. The prey is placed at the opening of the tunnel while she crawls inside to inspect it. Then, she comes back out and grasps the unlucky insect by the antennae and pulls it inside head-first. She has been genetically patterned to perform these motions, and if anything changes, she cannot complete this task. If the prey insect is moved a few inches from where she left it, she will quickly locate it and pull it to the entrance. Once again, she will go inside to inspect the burrow. This scene can be repeated time and time again, and each time the Great Golden Digger Wasp will perform the same acts. What looks like a thoughtful precaution, is simply genetically programmed into the species. Another habit that is programmed into these wasps, is that if the unlucky grasshopper happens to lose its antennae, she cannot pull it inside. It seems that the antennae are the only appendage that she is programmed to use for this task, and it never occurs to her to grab a leg to finish the mission. She will walk around it hunting the proper 'handle' for hours and often abandon her perfectly good prey to hunt another if the antenna is missing. Once she has pulled the paralyzed insect into one of chambers, she lays a single egg on its abdomen. Then she seals each chamber off. The unlucky prey remains paralyzed until the egg hatches. The larvae then have fresh food to sustain them until they emerge as adults, and then the cycle starts once again. One tunnel entrance will lead to as many as eight or ten separate larvae burrows. Great Golden Digger Wasps are not aggressive, but do sting if handled, so just let them go about their business of eliminating pests from your garden and drinking from your flowers. Those who garden with nectar plants to attract butterflies shouldn't worry either. These wasps only hunt members of the grasshopper family, so the butterflies are perfectly safe. 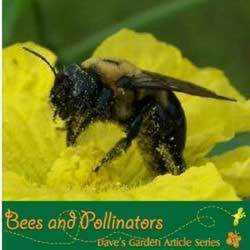 They are great pollinators, so should be welcome in fruit and vegetable gardens also. Needless to say, my vegetable garden could use a few less grasshoppers! It is perfectly safe to walk through a group of Great Golden Digger Wasps going about their business. They may be curious and fly over to investigate, but will remain peaceful. The only time that it is advisable to eliminate these insects would be if they build their nests in a high traffic locale, or in children's play areas. 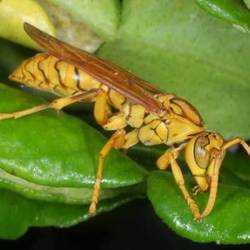 The Great Golden Digger Wasp is a beneficial insect, and should be considered an asset in any type of garden. Its peaceful attitude and pest hunting nature, make it a beautiful helper that requires simply a bare spot of dirt, and a healthy population of grasshoppers. Don't run for a weapon or the bug spray if one is spotted. Step back and observe one of the most unique inhabitants in the garden.